This 4K Kodi HTPC has two main objectives. The first is to produce a system that is capable of running Kodi media center and streaming 4K video content and the second is to build it for the lowest possible price. To achieve this we will not be using any performance components or large storage areas. We will be selecting the optimum components for running Kodi and those that present the very best value for money. You can also combine low budget with low power consumption, see our low power HTPC-NAS combo build 2016. 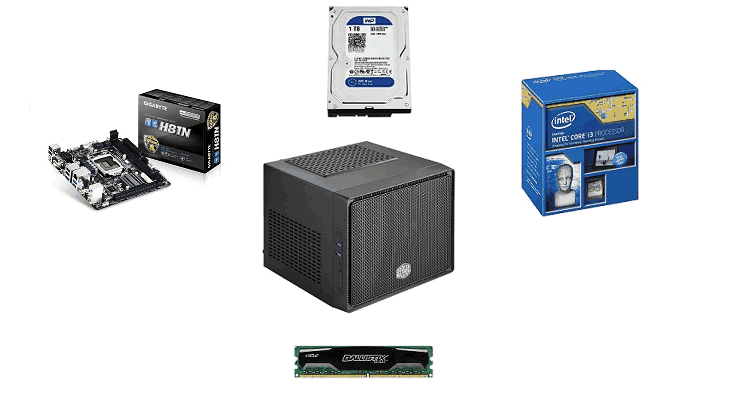 This build includes all core components with the exception of the power supply. For a suitable PSU I recommend the EVGA 500 W1 as this will give you the required power for the build at a good price. As we are aiming for simple, size is not important so our cheap 4K HTPC will be built using the mini-ITX form factor. One of the best looking cases for mini-ITX motherboards is the Cooler Master Elite 110. 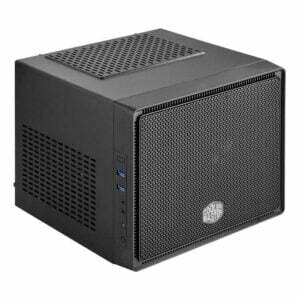 This is a compact cube style case with just enough space for HTPC components. The case comes in black with a sleek look to it and will sit nicely next to any living room TV. Although it is small it does have room for additional hard disks if you want to expand your storage capacity later down the line. I tend to use AMD CPUs for HTPC builds as they are generally cheaper but at the lower end of the processor ranges there is little difference. For this HTPC build for Kodi we will be using the Intel I3 4160 CPU. This processor is now two generations from the market leaders but is more than enough for OpenELEC, LibreELEC and Kodi media center. There is also a wider range of Intel motherboards for the mini-ITX form factor. The Intel I3 4160 is a dual core 3.6GHz CPU with 3MB smart cache. Although it only has 2 cores it does support hyper threading which can produce similar levels of performance to quad core processors. It supports DDR3 memory to a maximum of 32GB. All Intel I3 processors utilise socket LGA 1150 motherboards and the range for these is huge and we have plenty of features to choose from. The Intel I3 4160 is now relatively cheap and the optimum choice for this build. There are a number of motherboard requirements for this 4K Kodi HTPC. 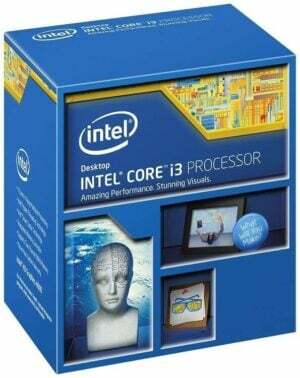 As we have selected an Intel I3 CPU we need a board that supports socket LGA 1150 processors. Secondly as we are going for a cheap 4K HTPC we want both on-board sound and graphics card solutions to save money on dedicated cards. The on-board graphics card must be capable of delivering 4K resolutions. 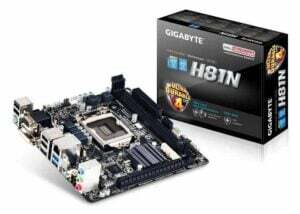 The Gigabyte Intel H81 mini-ITX motherboard fits our criteria. The board uses the Intel H81 Express chipset with socket LGA 1150 CPU compatibility. There are two memory DIMM slots supporting DDR3 at speeds of 1600 & 1333 MHz and up to a total of 16GB. It has a single PCI-E slot for if you want to add a dedicated GPU later down the line and a total of 4 SATA ports for storage area upgrades. It comes with both on-board sound and graphics cards and of course integrated Intel graphics chip supports 4K resolutions when used with a HDMI cable. When used together OpenELEC/LibreELEC and Kodi do not have particularly high memory requirements. The Kodi video decoders are efficient and use minimum memory resource. So, 2GB of RAM will be more than enough for any low budget 4K Kodi HTPC. Our selected motherboard gives us the option of either 1600 or 1333 MHz speeds and the price difference between the two is minimal. The Crucial Ballistix Sport range offers some high quality low budget memory solutions. There are cheaper 2GB memory DIMMS out there but these are only a few dollar less and possibly unreliable. The Crucial Ballistix memory DIMMs are robust devices and are built to last. As we are only using a single memory DIMM you have the option to upgrade in the future. 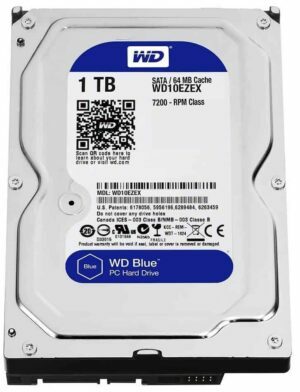 The Western Digital Blue hard disks provide low budget, every day use storage devices. Storage can be the most expensive part of a HTPC build and can significantly increase your build costs. For this build to remain a cheap 4K HTPC we want to have enough space to store a good selection of 4K movies but we do not need huge storage areas for PC games. With 4K streaming now becoming readily available the requirement for disk space on your HTPC is falling. Although this is a budget HTPC it has plenty of room for expansion. The motherboard will take CPU upgrades up to the Intel I7 (not Skylake) and there is a free DIMM slot for and additional memory module. Both the case and motherboard provide room for additional storage capacity so you can add more disks as your media libraries grow. 4K movies and videos are definitely the future for HTPC builds and in this I have shown that it is certainly affordable. On top of this build you will need a PSU and the EVGA 500 W1 will be more than enough for the specified components. For less than $300 you can put together an excellent 4K Kodi HTPC. How to Enable concurrent Windows login for the Remote Desktop?